Food and water are the most essential things for any human being to sustain on this earth. Because of burgeoning growth in population these resources are becoming scarce. In 1804, the population of world reached one billion mark. It took 123 years to reach 2 billion i.e. by 1927. But the rise became drastic after 1927. It took just 47 years to reach 4 billion mark (1974) and it is expected to reach 8 billion by 2025. At present the global population is reaching 7 billion. On the other hand, the land under cultivation has been decreasing day by day and the fertility levels of soil are also decreasing. In order to feed the hunger of the growing population, the genetically modified crops are proposed as an alternative by scientists. The actual process in this genetic modification is that the normal seeds are taken into labs and new genes are added to the genome of that seed with some modern techniques in molecular biology and genetic engineering. Those are named as Bt products. Bt means Bacillus Thurengenisis is bacteria which produces “crystal proteins” that kills insects. It was first found in 1901 in Japan while finding the cause for disease that has been killing silk worms. In 1911, German scientists named it as Bacillus Thurengenisis which caused the death of butterflies. From 1960 onwards these are being used as chemicals to kill insects in fields. Instead of using them as chemicals now their genes are being directly introduced into the genome of other seeds.The products produced from these are called as Bt products. Eg: Bt cotton, Bt corn etc. 1. It will protect the crop from the damage caused by the pests and insects and increase the productivity. 2. They reduce the need of fertilizers and pesticides that are sprayed in the fields which further reduce the investment on crop and increase the returns. At present these GM crops are being sowed in several nations and top 3 being U.S. (66.8 m hectares), Brazil (25.4 m hectares) and Argentina (22.9 m hectares). According to Food and Drug Administration (FDA) of U.S. at present there exist 40 varieties of plants for commercial sale. Tomatoes, soya been, corn and cotton are some examples. But there are several nations which banned the usage of the GM variants. Even in our nation we have seen protests against the products like Bt brinjal and Bt cotton. Such protests took place even in U.S. and to resolve them their government organized open meetings to obtain public opinion in California, Chicago, Oakland and Washington D.C.
1. People are afraid of consequences of these GM foods if the pests developed resistance against these plants, just like mosquitoes developed resistance against the insecticide DDT. 2. 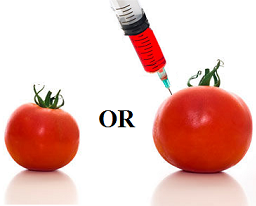 The GM seeds which are generated in labs may transfer the agriculture into the hands of multinational corporations. 3. The above two points indicate the rise of investment on farming. 4. These genetically modified crops may affect the butterflies and other insects which are responsible for cross pollination. 5. Even though the introduction of these varieties in commercial crops likes cotton, they may not affect the human beings directly but cause genetic disorders in animals which take the leaves of those plants as fodder. Hence keeping all these points in consideration, the productivity of agriculture has to be improved by using methods like organic farming, step cultivation etc.